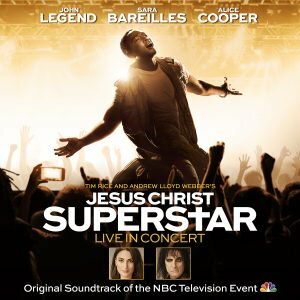 “Jesus Christ Superstar Live in Concert” – DVD of the NBC Television Event Available Now! We’re thrilled to announce the release of The Jesus Christ Superstar Live In Concert DVD, available now on Amazon! The production was helmed by esteemed British theatre director David Leveaux. Rounding out the full, award-winning creative team is Emmy Award-winning live television director and executive producer Alex Rudzinski (“Hairspray Live!,” “Dancing With the Stars”), Emmy- and Tony Award-winning costumer designer Paul Tazewell (“The Wiz Live!,” “Hamilton”), Grammy Award-winning music producer Harvey Mason Jr. (“The Wiz Live!”), musical director Nigel Wright (“Jesus Christ Superstar” world arena tour), production designer Jason Ardizzone-West (“Adele Live in NYC”) and choreographer Camille A. Brown (“Once on This Island”). “Jesus Christ Superstar Live in Concert,” a staged version of the original rock musical, was executive produced by Andrew Lloyd Webber, Tim Rice, Marc Platt, Craig Zadan, Neil Meron, John Legend, Mike Jackson, Ty Stiklorius and Alex Rudzinski. Jesus Christ Superstar Live in Concert will be produced by Universal Television, Tim Rice, Andrew Lloyd Webber, Marc Platt Productions and Zadan/Meron Productions. Listen to the JCS Live In Concert cast album here!